What are Browniepops ? They are the perfect combination of gooey brownie interior with a crisp chocolate exterior on a stick, available in 11 unique flavors. Browniepops sent my family a adorable 6 pack of Browniepops that comes beautifully packed. My boys just thought it was just the coolest thing to have a brownie on a stick ! They make a perfect dessert, great with a cup of coffee or just an anytime treat ! They are very yummy and are the perfect size. If you are looking for a unique gift for someone they make Browniepops for any holiday or special occasion. If you order for a gift order extra because YOU WILL want to eat them all. 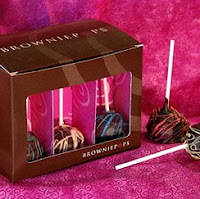 Win A 6pk of Browniepops ! 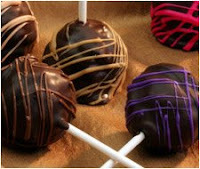 Visit Browniepops, then leave a comment letting me know which flavor you would like to try. February 1, 2009 at 11:15 AM This comment has been removed by the author. sorry, totally screwed up the first one. Toffee or Caramel both look good, can't choose just one. Caramel would be a must have for me! The cream cheese swirl sound yummmmmmmmmmmmyyyyy! I would LOVE to try the Peanut Butter flavor. It looks GOOD! I would love to try the peanut butter flavor! Mmmm, they all look yummy. I think the one I would want to try first are the Cream Cheese Swirl pops. Original chocolate would suit me just fine!! Peanut butter looks good to me. The Chocolate Malted sound delicious! Toffee sounds great to me! Caramel is my favorite for any candy or sweet. So, I pick caramel! What a unique and wonderful idea. I'd love to try the walnut brownie ones. Thanks so much. I would have to say the peanut butter. You can't beat the original! Since I've never tried these before, I'd love to try Browniepops' Original Chocolate flavor. They look wonderful. February 1, 2009 at 6:04 PM This comment has been removed by the author. oh my, Misouri mud sounds amazing. I subscribed via e-mail as well! They all sound great! I would choose the Cream Cheese Swirl. I would have to have Missouri Mud. Yum! I'd love to try a walnut browniepop! Thank you! The Cream Cheese Swirl sounds amazing! as does the rasbrerry! yum yum!! i also have your button up on my blog! im suprised there is no orange flavoreed chocolate brownie. OMG! They look absolutely yummy! I don't know which one I would pick. I like them ALL. I guess I would go with the peanut butter. Thank you. I would like to try the Caramel! I would like to try the Cream Cheese Swirl!! The caramel sounds sooooooooooooo good! cream cheese swirl sounds so good! The Cream Cheese Swirl sounds fantastic. Cream Cheese Swirl for ME! Our family loves Caramel. These look so good. Oh, yum! I'd have to choose peanut butter because peanut butter and chocolate are my absolute favorite. Delicious! The Missouri Mud sounds yummy. Thanks! i would like to try missouri mud! i would like to try Original Chocolate. I spelled peanut wrong! Oh well. I FOLLOW! I love them all but the Caramel would be eaten first. I like the chocolate malted. The Cream Cheese Swirl sounds fantastic! I would LOVE to try cream cheese swirl!! love to try the mocha! Cant decide between Cream Cheese Swirl or Peanut Butter! MMMM. Missouri Mud sounds wonderful! Thanks for the giveaway. I would love the raspberry flavor. I love chocolate and raspberry together. Thanks for the most yummy giveaway! Hands down...peanut butter :) YUM!! would LOVE to try Mocha! love to try peppermint and raspberry...yum! Wow hard to pick one but I will go with toffee. cream cheese swirl. All look good. Thanks. The Peppermint sounds good, but I'm a purist, so the Original Chocolate would probably be my favorite. Those seasonal Browniepops look terrific, too! All of 'em look oh so yummy! I'd like to try missouri mud. Thanks. I would love to try the toffee flavor. All of the flavors sound tempting though. Cream cheese swirl AND toffee are at the top of my list! Would like to try peppermint first, but there are several others that run a close second! Missouri Mud sounds really good. Caramel would be great too. Thanks. I'd really love to try the missouri mud and the peppermint! Thanks for the chance!! I'd like ot try the Cream Cheese swirl. The Cream Cheese Swirl sounds like it would be wonderful. oh yum. These sound delicious!! I'd love to try the peppermint! I'd like to try the walnut one. Thank you very much! We'd love to try the original chocolate! They look so good! The Missouri Mud is so pretty! I would like the Cream Cheese Swirl! Thanks! I'd love to try the chocolate malted! I think I'd have to go with the cream cheese swirl. Cream Cheese Swirl or Caramel Yum! Christina - xristya@rock.com - I'd like to try Chocolate Malted Browniepops!